[Background] Laparoscopic surgery for the colonic diverticulitis has following unique aspects that are different from surgery for colonic cancer, 1) Due to the inflammation of the bowel and mesocolon, it is difficult to keep proper dissectional plane, 2) resection of long-segmental colon usually needs to mobilize the splenic flexure for the safe anastomosis, 3) complicated inflammation sometimes requires Hartmann procedure or additional segmental resection of adjacent organs, 4) In Hartmann reversal, adhesions of the small bowel and the rectal stump is hard to release under the laparoscope. In this study, we summarize the results and discuss the advantage of Hand-assisted laparoscopic surgery for colon diverticulitis. [Patients and methods] Seven patients@(2: right-sided, 5: left-sided) operated under the laparoscope. For sigmoid diverticulitis, 8cm lower midline incision was made first, and dissection or resection was performed under the direct vision as possible. Remaining mobilization of mesocolon, and splenic flexure were performed with hand assistance. GelPort was usually used to maintain pneumoperitoneum during HALS. In the reversal operation, take-down of stoma was performed first and GelPort was attached to the stoma wound. 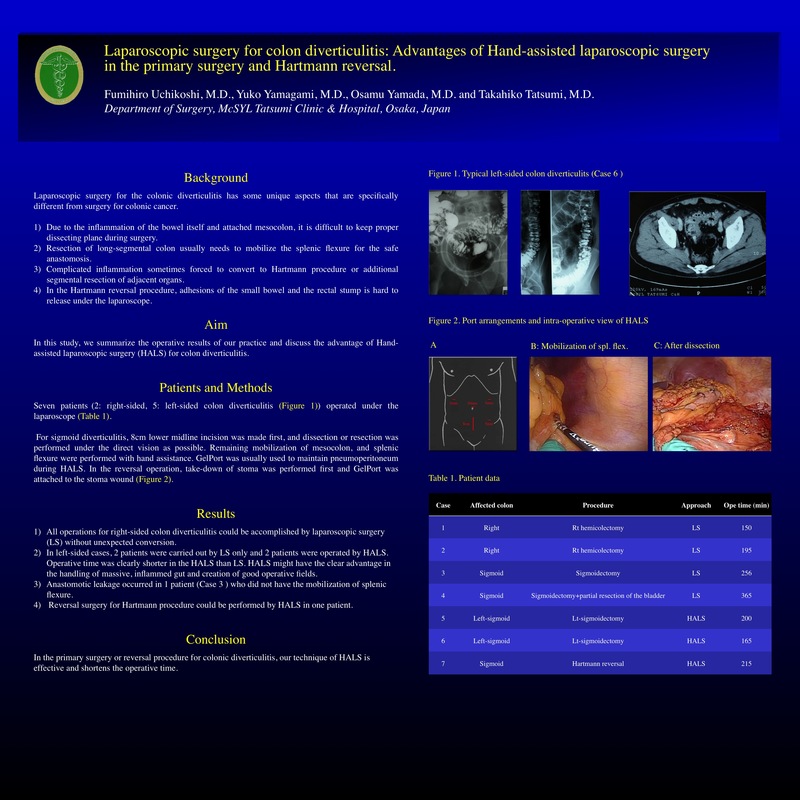 [Results] All operations for right-sided colon diverticulitis could be accomplished by laparoscope without unexpected conversion. In left-sided cases, 2 patients were carried out by laparoscope only (operative time; 256 and 365 min) and 2 patients were operated by HALS (165 and 200 min). Reversal surgery for Hartmann procedure was performed by HALS for one patient (205 min). [Conclusion] In the primary surgery or reversal procedure for colonic diverticulitis, our technique of HALS is effective and shortens the operative time.